Dry cast limestone is durable, but like natural limestone, can be damaged if handled incorrectly. Longshadow Products are packaged in triple wall cartons attached to heavy duty pallets and shipped via common carrier tractor trailer trucks. Please read and follow the installation instructions provided with each item. Most Longshadow Products are heavy and require professional installation and concrete footings appropriate for local conditions. Assembly requires experienced riggers, masons and equipment operators. 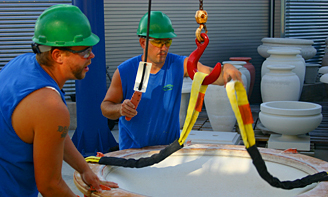 Clean endless roundslings, a planter harness (or both), equipment and a crew with clean hands are required for positioning pieces. Padding is required. Place the supplied drain mats felt side up over drain holes. Use high quality growing medium that drains well. Seal joints between bowls and bases. The thick walls of Longshadow planters protect roots from heat and preserve moisture naturally. Good drainage is necessary for proper growing conditions. Wilting plants, soggy growing medium, staining, lime-bloom or mold on the outside of the planters are indications that drainage is blocked. If blockage is indicated, the growing medium must be removed and the drain flushed out. Dry cast limestone is slightly porous and, in winter, can withstand freezing and thawing as long as good drainage is assured. Longshadow dry cast limestone is slightly porous. This porosity reduces possible damage from freeze-thaw cycles. The supplied soil filter square should be placed, felt side up, over the drainhole. Use well draining, high quality, loose growing medium. The thick walls of Longshadow planters protect roots from heat and preserve moisture naturally. Good drainage is necessary for proper growing conditions. Wilting plants, soggy growing medium, staining, lime-bloom or mold on the outside of the planters are indications that drainage is blocked. If blockage is indicated, the growing medium must be removed, the drainage must be flushed out, assured and maintained. Good drainage is required to prevent accumulation of water inside planters. Water expands as it freezes and could cause damage. Many owners use the growing medium to anchor a display of evergreen boughs and berries. Longshadow dry cast limestone planters can withstand freeze-thaw cycles as long as drainage is assured. It is not necessary or desirable to seal the interior of Longshadow planters and voids the Longshadow warranty.